Alex Bundy - "Planetarium Music: Traditional Psychedelic Electronic Music (Planet 2)"
Alex Bundy, Yume Bitsu's keyboardist, takes a break from his band for a moment to offer his second solo effort, an exploration of "traditional" styles of electronic music. Forgoing the danceable electronica of his contemporaries, Bundy steps back to a time when texture and spaciousness were more important than a good beat. He does, however, eschew the old analog style instruments in favour of modern digital equipment. What comes out of it, is not quite traditional, and not quite modern, an amorphous flow of electronic soundscapes that fills a niche somewhere between. The opening track, Introduction, is strangely misleading, as it has a far more mechanistic feel to it than most of the rest of the album. It's seems, in some ways, to be an introduction to the final piece on the album, Metal. Both tracks, full of robotic plunks and industrial drones, book end the album in an odd, but not off-putting manner. 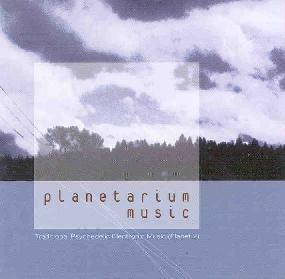 On his web site, Bundy says that the music on this album is "designed for planetariums and other ideal, artificial environments". It struck me that he goes through the process of transporting the listener from a less than ideal artificial environment, into a more tranquil, ideal one, and then back out again at the end. In between, in the ideal environment, the music creates a number of varying moods. Modern electronics seem to lack a bit of the warmth and spaciousness of the old analog synthesizers, though Bundy's music doesn't suffer from it. It revels in its coolness, extending outwards just far enough to meet the confines of its artificial environment. Terrible is perhaps a reminiscence of the outside environment, as the listener begins to realize that he or she has stepped inside something a little more peaceful. My favorite track on the album, Another World confirms that, with it's droning sheets of sound, softened by burbling waves of cosmic noise. Tribute simplifies the feeling, its uncomplicated melody, reminding one of something Brian Eno or Cluster may have done. What it lacks in spaciousness, it makes up for in a simple joy of the moment. Continuing in Cluster inspired territory Annual is a throbbing excursion into the slightly more malign corners of the imagination, set to an all-encompassing heartbeat. Neighbor, the second last piece on the album, starts in a tranquil and organic space, with soft, round tones caressing the listener's mind, but it gradually takes on a harsher, more synthetic tonal quality, reminding the listener that this is indeed, an artificial realm, and there is another less pleasant, neighboring one, waiting on the outside. Whether or not Alex Bundy consciously strove towards this atmosphere or not, it still remains that he has created a mature and complex work of electronic composition. It's at times gentle, at other times unsettling. Its simplicity is deceiving. There are far more layers to Planetarium Music than initially meets the ear. For more information you can visit the Planetarium Music web site at: http://www.planetariummusic.com/. Traditional Psychedelic Electronic Music is distributed by Strange Attractors. You can visit their web site at: http://www.strange-attractors.com. Contact via snail mail c/o Strange Attractors; PO Box 13007; Portland, OR 97213-0007.